then decayed into atoms of seaborgium-261. so that all its particles are in balance. toward the end of his life. particularly if they shined or sparkled. One heavy stone in his garage glowed in the dark. It was difficult for Derf to ignore it. He kept thinking someone had left the light on. He took a chisel and broke off a few grains of it. into which he poured a cup of used battery acid. and believed in extraterrestial visits to Earth. and could have big consequences for mankind. was anything too much to hope for? Wealth? World peace? Flying cars? An emerald gas evanesced from the pickle jar. Could this be volatile oxides of osmium? Derf thought he should name it L. Frank Baumium. But maybe it was primordial gasium. and you’ll never have to fill it up again. he opened his garage door and stood well back. Prash Derf tested not another stone. His desire to discover new elements was over. You cannot measure the melting point of a metal unless you can put two or more of them together long enough to heat them up. 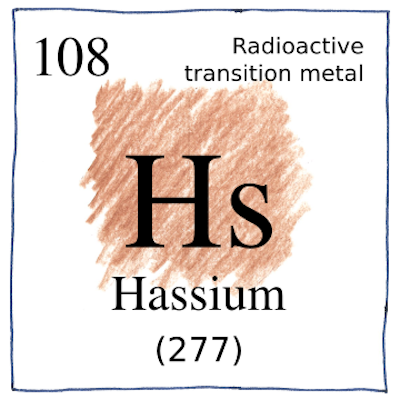 This has not been accomplished for hassium. However, some chemical properties have been confirmed by gas-phase experiments.